I just use fingers for my low-tech clicker-alternative. If a question has a small integer answer, I'm all set. If not, I could do the multi-choice thing. I was thinking I had to learn how to use clickers, because I want to try imitating the Good Questions Project. But now I'm thinking maybe I can skip that step. For whatever reason, I find the colors much easier to cognitively process and judge than numbers of fingers or thumbs up/thumbs down. Thanks for sharing this. I appreciate the photos. They really help to convey how this method works from the teacher's point of view. 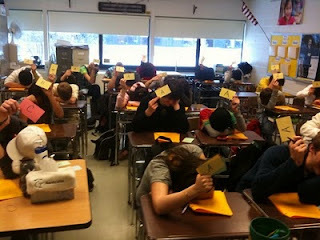 I noticed you have your students cover their eyes when reporting answers. 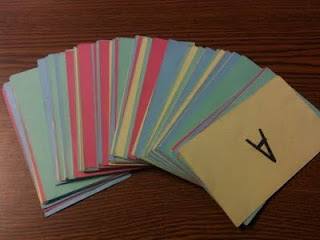 This is important since you use color-coded index cards. Otherwise students could check out the back of their peers' index cards before responding, which would lead to a "lemming effect" in which students don't answer independently. There's evidence that some versions of the response card method lead to the "lemming effect," almost as much as a show of hands. Clickers provide more assurance that your students' answers are really their own. I'm not sure how your eyes-covered method fits into this. It's certainly important to get accurate responses from students if you're going to make teaching decisions based on those responses. I noticed the faces covered as well- did you do this because the pictures were getting published online or do you have them cover their faces everytime they hold up a card? Because it was going online. This way makes it easier to cheat than clickers. That's a valid point. But that's the reason for the "3-2-1 hold em up" business. And, with this method that requires a response from everyone, way more kids are attempting the example problem as requested in the first place. I like the colors too, it seems like it would make it easy to gauge right/wrong or get it/don't get it really quickly! I've been using (minimally, I admit) some el-cheapo mini marker boards for the same purpose. 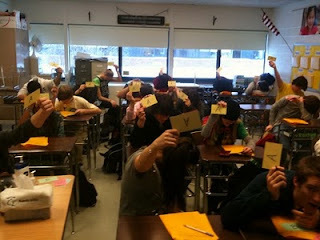 I have students write their answer big enough for "a blind old teacher" to see it and hold it up. Works great b/c there is a coordinate plane on the back, so graphing is super-easy to check! Thank you for elaborating on how you use this system. You can do the same with black backs to the index cards. It minimizes some of the lemming effects for those in the back if your class is built real deep instead of wide. I've got a set of fancy clickers that I use but the setup can be an utter bear. Having something that I can use in a pinch and without worrying about creating slides, the students getting the clickers, my usb port not working, etc. will be great. I think I'll have my student assistant start making a class set. I love this idea - thank you. I like how they are so overwhelmed, they've bowed their heads in shame. I was wondering how you got a video clip of your computer screen while recording your voice instructions. Did you use a special program or did you just use a camcorder on your computer screen? Hello, TeachingNinja. I am completely jealous of your handle, btw. And your calculus blog looks super cool. I like the mindset survey. I'm stealing that. I use the "Smart Recorder" that comes with the software for the Smart Board to capture my little videos. It just goes to show how a low-tech solution can be just as effective as the expensive one! One of my 2010 projects is how to use bluetooth from students mobile phones as a clicker system, as I've heard rumours it can be done. The mini-whiteboard solution also effective - they can be just as interactive as a Smart board! One other downside of the response card approach is that it's more difficult to hold students accountable for their participation. In a small class, this is less of a problem, but in larger classes, it can be helpful to incorporate response activities in students' grades. Clickers, of course, make this easy. There's also the fact that the students can't see the distribution of responses. For some questions, it can be highly motivational for the students to see that, for instance, two or three answer choices are popular. This communicates the difficulty of the question and can motivate students to engage more deeply in subsequent discussion. I'm not intending to come off as the critic here! I think it's great that you're using this technique. 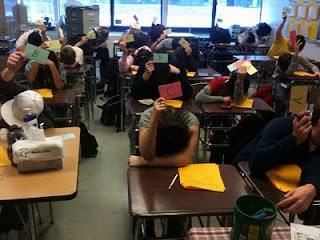 I just hear a lot the concern that clickers aren't worth the cost when students can respond by raising their hands or via response cards. There are indeed a few things that clickers provide that other response methods don't, and in some teaching contexts, these additional advantages can be very important. I too shun using clickers as I find it just one more thing that takes my valuable time. I use a system similar to the 4 cards idea. I have students fold a sheet of paper (plain white copy paper) in half twice to make 4 sections. They place an A, B, C, D in each part and can color them...some add some personality to it. I often post a practice problem for them to do (using Notebook software - I have an airliner slate). I give them some time to work out the solution before I show the multiple choice answers and then countdown from 5 for them to hold up their answers. For those of us in districts that are a little short on money, this is a great idea! I'll be sharing this with the rest of my department. Thanks! This is a tad late, I know, but I only just caught on to this idea and tried very basic clickers (green/red) in class today. I certainly loved the instant info on how the students were doing,and a quick poll of the class told me the kiddies liked it as well. However, what do you do when amid a sea of green there is just one or two red? Today, I simply asked the single red student what it was that was unclear. It worked out well, but I can see how with a different class or student that could make the student feel uncomfortable. Also, some students were very keen on looking around to see what color others were showing. I'm planning on having a mini-talk with the class about minding ones own business, but if there is some trick available I'd like to know about it. I think that with these poor-man clickers it's even more important than usual to have a classroom atmosphere in which being wrong, or showing confusion, feels safe for all students. This seems like the coolest challenge in a long while, so thanks very much for the tip!